We have successfully been using Notepad++ for writing Control Program files - PGM and MP files, as well as Archive report configuration files (SAC files). We have found that it to be an excellent alternative to Notepad. With all the features it provides, Notepad++ (see http://notepad-plus-plus.org ) makes it easier to see and edit code. Therefore, we highly recommend our SysCAD users install it. It is free to download and install under the GPL (GNU General Public License). Function auto-completion and tips are only available with Notepad++ version 6.3 and later. Please download the latest version of Notepad++ and the required SysCAD xml files from our download site (https://www.syscad.net/login/), if you do not have all of the files described below. Other features can be found on this site: http://notepad-plus-plus.org/features. 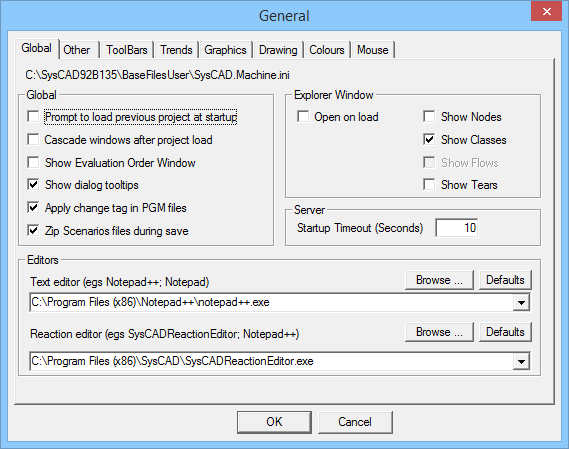 Downloads page | SysCAD 9.3 (requires Username and Password) | Notepad++ (Install File) and SysCAD Notepad++ Files (User Defined Language Files). The default location for Notepad++ is C:\Program Files (x86)\Notepad++\ - you can change this location if required. Close and restart Notepad++ for the changes to take effect. If colours are not visible when Notepad++ restarts, go to menu option "Language" and select "SysCAD PGM" from the List of User Defined Languages. Function parameters hint of input. Click on 'Close' and this functionality will be available for pgm and mp files. Do note that you can change the preferences at any stage. If Notepad++ was installed in the System default folder, then user may simply press the Defaults button to automatically enter the location. Once this is done, the next time you press the Edit_PGM or Edit Archive button in SysCAD, Notepad++ will start up. Editing other types of referenced text files from SysCAD will also be in Notepad++. To change your Tab size and change tabs to spaces select Settings|Preferences|Language Menu/Tab Settings. To display line numbers Select Settings|Preferences|Editing and check Display line number. To decrease the line spacing Select Settings|Style Configurator|Global Styles|Brace Highlight Style and change the font size to 8. If you have installed Notepad++ and set SysCAD up to use this as the default text editor, but the PGM files do not display colours for the key words. It is likely that the User Defined Language (file SysCADLanguage.xml or userDefineLang.xml in Notepad++ installed folder) has not been added or configured correctly for SysCAD. If colours are still not visible when Notepad++ restarts, go to menu option "Language" and select "SysCAD PGM" from the List of User Defined Languages. Re-install Notepad++. At the 'Choose Components' step ensure that you tick "Don’t use %APPDATA%". This is very important, if you do not check this component then Notepad++ will not recognise the key pgm words. It is possible that an install may not "repair" the installed version, in this case uninstall first and then reinstall. This page was last edited on 29 May 2018, at 00:13.